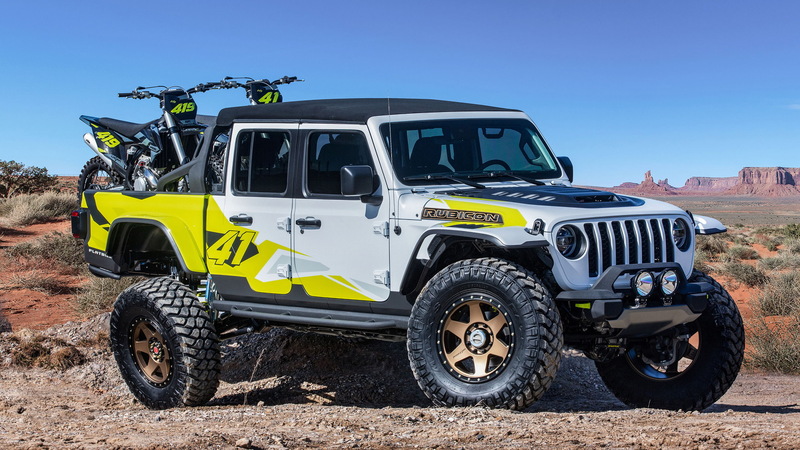 Jeep will once again use the annual Easter Jeep Safari in Moab, Utah, to roll out a bevy of wild concepts—concepts that typically hint at what's coming down the line, either directly from Jeep or through the Jeep Performance Parts and Mopar catalogs. 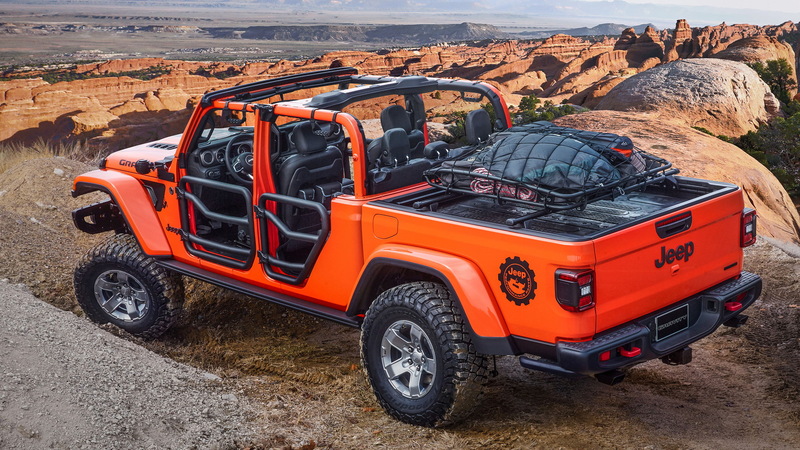 Naturally this year the focus is on the newest addition to the Jeep lineup, the 2020 Gladiator mid-size pickup truck, and fans will be treated to everything from a bug-out vehicle to a classic restomod to some crazy rock climbers. Jeep JT Scrambler: This concept starts as a Gladiator Rubicon and then goes retro with its 1980s-era CJ8 Scrambler color scheme and graphics. The retro theme continues inside with brown leather with orange accent stitching. 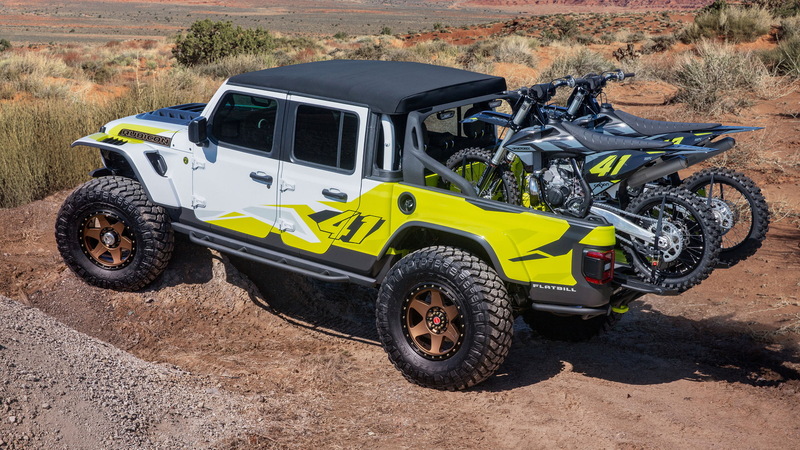 Performance upgrades include 17-inch wheels with 37-inch off-road tires; a 2-inch diameter sport bar, plus a cold-air intake and cat-back exhaust for the Gladiator's stock 3.6-liter V-6. Jeep M-715 Five-Quarter: Sure to be one of the favorite concepts is a restomodded example of the Kaiser Jeep M-715 military truck. This beast of a truck keeps the tough looks of the original but swaps from metal to carbon fiber. The designers also dropped in a Hellcat 6.2-liter supercharged V-8 and all 707 horsepower that comes with it. In case you were wondering, the Five-Quarter in the name is a nod to Jeep trucks of the past that were one and one-quarter tons, i.e. five quarters. Jeep J6: Another concept that's sure to be popular is the J6, essentially a Gladiator with a 2-door cab. By dropping the rear doors of the stock Gladiator, the designers were able to fit a bed with an extra 12 inches, thus making a vehicle with more cargo carrying capability. To complete the look, the designers also added a 2.25-inch sport bar, underbody protection, 17-inch beadlock wheels, and 37-inch off-road tires. Jeep Wayout: Campers will enjoy the Wayout as it features a custom canopy on which sits a tent big enough for two. And so you can travel deep into the brush, the concept features extra protection around the body and two custom-fit auxiliary fuel tanks integrated into the bedsides. Also part of the package is a 2-inch lift kit, 17-inch wheels, 37-inch mud-terrain tires, and a 12,000-pound Warn winch in case you get stuck. Jeep Flatbill: This concept was inspired by Motocross culture and thus features a wild appearance coupled with extreme off-road capability. The latter is made possible via Dynatrac Pro-Rock 60 front and rear axles, an Off-Road Evolution 4-inch lift kit, 20-inch wheels, and massive 40-inch tires—the latter is a first for a Gladiator. The engine also gets a little kick in performance thanks to a cold-air intake. 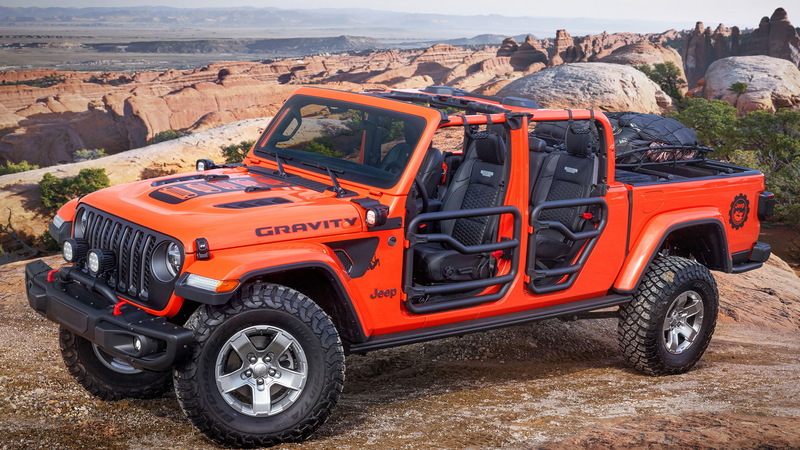 Jeep Gladiator Gravity: The sixth and final concept is perhaps best suited for an event like the Easter Jeep Safari. The rock crawler-themed truck features a 2-inch lift kit and runs on 17-inch wheels and 35-inch tires. 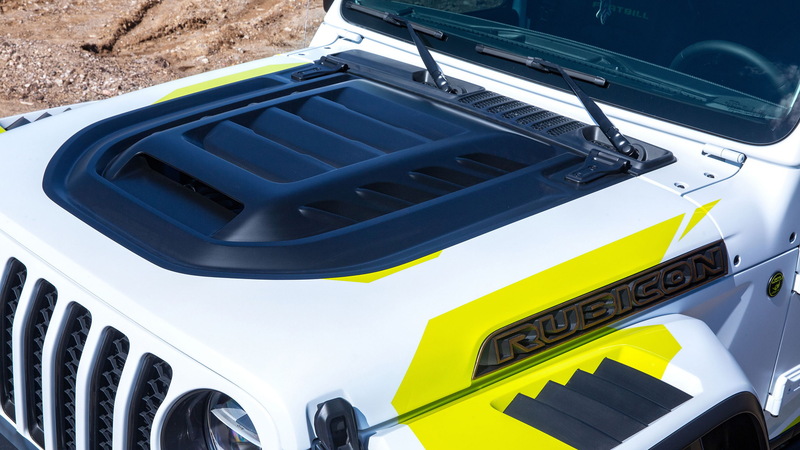 Heavy-gauge steel rock rails are thicker and wider to help maximize protection of the cabin, while a front brush guard adds extra protection to the vehicle. A cold-air intake and cat-back exhaust meanwhile provide extra performance to help you charge up any climb. This year's Easter Jeep Safari runs from April 13-21.